The black hole at the center of the super giant elliptical galaxy M87 in cluster Virgo fifty million light-years away is the most massive black hole for which a precise mass has been measured -6.6 billion solar masses. Orbiting the galaxy is an abnormally large population of about 12,000 globular clusters, compared to 150-200 globular clusters orbiting the Milky Way. In order to calculate the black hole’s mass, the astronomers measured how fast surrounding stars orbit the black hole. They found that, on average, the stars orbit at speeds of nearly 500 km/s (for comparison, the sun orbits the black hole at the center of the Milky Way at about 220 km/s). From these observations, the astronomers could come up with what they say is the most accurate estimate for the mass of a supermassive black hole. Future calculations may attempt to calculate the size of another black hole with a roughly estimated mass of 18 billion solar masses, which is located in a galaxy about 3.5 billion light-years away. 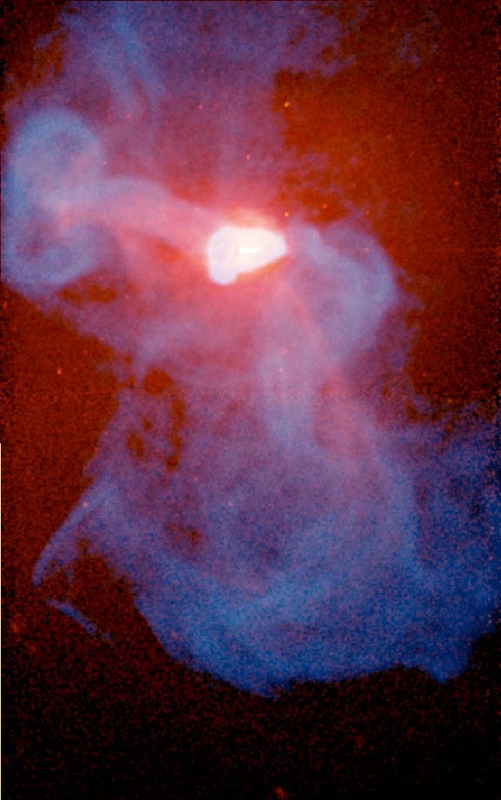 In the image above, a central jet is surrounded by nearby bright arcs and dark cavities in the multimillion degree Celsius atmosphere of M87. Much further out, at a distance of about fifty thousand light years from the galaxy's center, faint rings can be seen and two spectacular plumes extend beyond the rings. These features, shown in X-rays, together with VLA radio observations, are dramatic evidence that repetitive outbursts from the central supermassive black hole have been affecting the entire galaxy for a hundred million years or more.